One of the advantages of the Manga Movable Feast that I’ve discovered is that it helps me expand my taste in manga. Without it I never would have given any of Natsume Ono’s work a chance. And I’m glad I did try it out, because I’ve once again realized how narrow my tastes really are. While I enjoy comics in general, and manga in specific, I’ve never been the first person to argue that they are literature. Not because I don’t think they are deserving of the label, but because it’s a discussion I’ve never felt I needed to become a part of. My personal opinion on the matter is that there’s no need for arbitrarily labeling things according to their perceived worth. Everyone should just enjoy what they enjoy. House of Five Leaves is challenging that opinion in a way I cannot ignore. And so I will take my first step into this debate. First of all we need to understand what my definition of literature is. Literature is anything that conveys a narrative in a skillful, intelligent manner. It may, or may not, have an allegorical reading associated with it. House of Five Leaves is the story of Masanosuke Akitsu, a jobless Samurai who was dismissed as a retainer, and has been fired from every bodyguard job he’s ever taken. He’s timid and the exact opposite of what most people think of as Samurai, but his pride keeps him from taking jobs he believes are below him. It isn’t until he meets the mysterious Yaichi, who hires him as a bodyguard, that he starts to question this resolve. 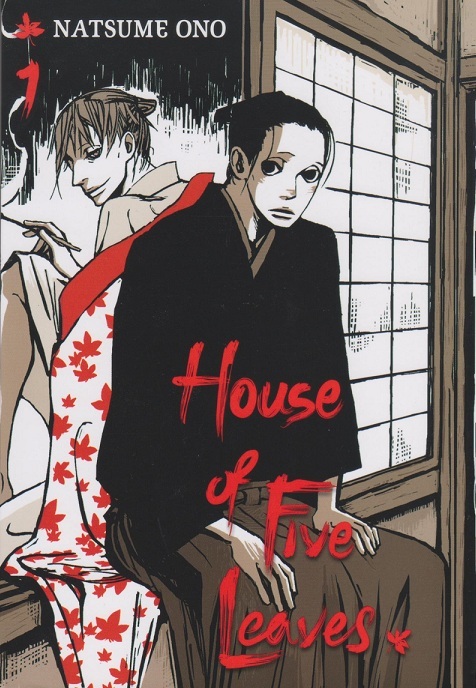 Shortly after taking the job, Masa learns that Yaichi is the leader of a gang of kidnappers known as the House of Five Leaves. Despite being uncomfortable with the House of Five Leaves’ activities, Masa keeps finding himself drawn back to their company. Part of it is wanting to learn more about Yaichi, whose attitude Masa admires; while part of it is enjoying the company of the other members of the House of Five Leaves. Then there’s the matter of money, Masa slowly comes to the realization that resisting the money is easier said than done. Normally, weak willed or timid main characters don’t work. Even if questioning oneself is common to most people, there are few that want to see that in a character. Masa works because despite being timid, he is also a competent swordsman, and has a strong sense of right and wrong. With this character setup, it becomes incredibly interesting to see his interactions with the apparently amoral Yaichi. The art style is minimalistic in a deliberate, pleasing way. In a way it reminds me of ink paintings, with focus given to only the most important details. While the character designs are loose, they are also given enough individual characteristics to make them easily identifiable. House of Five Leaves is literature because it is created with deliberate, obvious skill. The art may look sketchy to some, but that is a clear stylistic choice that Ono made to allude to traditional ink painting. By doing so she creates a parallel between the minimalistic approach ink painting takes and her story telling style. She reinforces the ink painting allusions by making the stylistic choice much more obvious in her cover pages. The important thing to keep in mind is that House of Five Leaves is meant to be read the way an ink painting is meant to be appreciated. It’s not so much about the details that are there, but rather those that are not. By keeping to the essential elements of any narrative, Ono allows for the reader to fill in the blanks where they want. Ono has essentially instilled her work with a poetic flair. Allowing the reader to fill in the blanks is used to considerable success in comedic scenes. Rather than show Masa fall down the stairs, or eat the sleeping drug infused daifuku, Ono instead shows the set up and the aftermath. She capitalizes on the effect by showing others’ reactions—usually Matsu’s—to Masa’s ineptitude. It’s a direct contrast to Kiyohiko Azuma’s approach to humor that still works splendidly. In the end, the best argument for House of Five Leaves as literature is simply that it is well crafted, and deliberately so. Real artistry went into the creation of this work, setting it apart from cheap schlock meant to thrill at the lowest common denominator. House of Five Leaves has feathered the nose of my inner snob. Expect the sneeze to be pretentious.